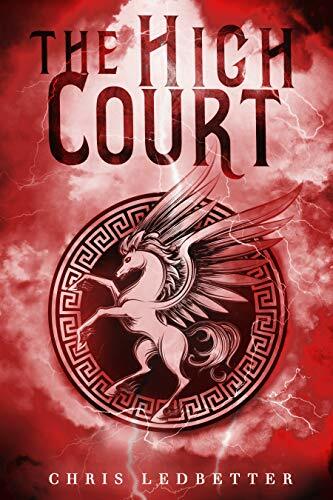 The sequel to the wonderful debut series The Sky Throne, we find young Zeus struggling with forces from beyond Mount Olympus in The High Court. The book picks up after there has been a lull after the tumultuous events of the previous book, with Hyperion and Kronos both being tried for crimes and will be hopefully brought to justice soon. It is when these trials grow near that the school, which is already underway with a new semester, when giants attack and force the occupants to flee. Zeus in the meantime is poisoned and will have to find a cure, before he succumbs the toxin. Ledbetter is not letting his heroes off easy in this next book and as is tradition with second books of a series, the stakes are even higher than before. It is clear that his style and refinement in the craft is better handled than in the previous book. The characterization of Zeus also seems to be maturing somewhat, which fits because the characters are getting slightly older as time on Olympus passes. The world building of this series continues to amaze, since not since Percy Jackson has an author created such a self-contained world of mythology and used it to such effect. It would be derivative to compare it to the likes of Harry Potter or other classic series where the majority of action and story happens at a school, but Ledbetter uses this setting to his advantage at every turn. The only true issues that come up in this book, is the pacing. It’s hard to say if this book is the middle book of trilogy or another episode of a series, since there are places where the plot kind of peters out. This is made up for the stylized action sequences, but it is still something to be wary of when moving forward through the narrative. All in all, Ledbetter has written another great installment in his Greek mythology series and anyone who enjoys fantastical settings and compelling, fun characters would be remiss to skip this series. Looking forward to the next entry of The Sky Throne. 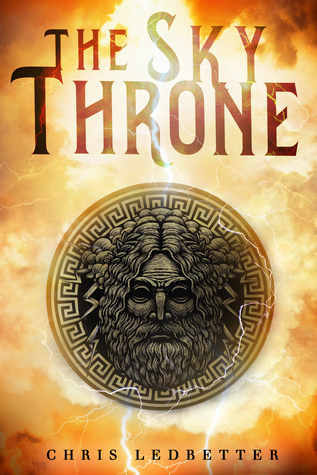 The Sky Throne is a tale set in Ancient Greece and follows young Zeus who finds himself entangled in a conflict that reaches the slopes of Mount Olympus itself. Why was this an important book for you to write? Many myths feature deities as fully grown. Since I’m a young adult author, I wanted to re-imagine them as adolescents. I wanted to try to use the myths as a base from which to pull, and then use their grown personalities to drill down and perhaps find out how they came to be that way. The story has roots in the Greek mythology. Do you read books from that genre? What were some books that you think influenced The Sky Throne? I’ve read Ovid’s Metamorphoses, The Odyssey, The Illiad, The Aeneid. I’ve also read some young adult books that feature Greek deities, or at the very least, their offspring. Such titles include Tera Lynn Childs’ Oh. My. Gods. and Sweet Venom, Jennifer Estep’s Touch of Frost, and Rick Riordan’s Percy Jackson series. I enjoyed seeing these mythological gods as young angst filled teens. I found Zeus to be a very well written and in depth character. What was your inspiration for his emotional turmoil through the story? Once I set Zeus on his path, I just tried to get as far inside his head as I could. I did find some inspiration from various bits of movies, though no single movie stands out. What is the next book that you are working on and when will that be published? I am currently writing book 2 of The Sky Throne, tentatively called The High Court. It will be released in spring of 2018. The Sky Throne, by Chris Ledbetter, is a tale set in Ancient Greece. Zeus, a youthful prankster, finds himself entangled in a conflict that reaches the slopes of Mount Olympus itself. Living a life as an unknown, Zeus’s world changes entirely with the violent attack by an Elder deity, Hyperion. Zeus, seeking an answer for this attack, finds himself at Mount Olympus Preparatory Academia. He finds sanctuary and a temporary reprieve from the sorrow that haunts him, but trouble still follows him. Students and faculty begin to vanish from Olympus, which leaves Zeus and his peers to solve the mystery. Ledbetter takes the best pieces of contemporary YA and gives them their own mythological flare. The academia of Harry Potter becomes the independent schools of the Mediterranean and Aegean. The survival of The Hunger Games is embodied by Zeus’s ingenuity throughout the story. Even tones of Red Rising can be felt in the opening pages of the very humble beginnings of a character we have known about for thousands of years. The breadth of the world is very thorough, and will please any Grecophile. Ledbetter covers everything from Crete to Tartarus, and all that lies in between. These very familiar characters from mythology are made a new by being “made young” and formed into literal student roles. The twist on these old figures was one of the reasons why I kept turning the page. This, and the mystery of Zeus’s parentage, kept me enthralled with the character; especially since Zeus is a character that not only grows and changes throughout the book, but becomes endeared to the reader. For example, he consistently struggles with how to flirt with girls! The actual pacing itself is done quite well. Within the first dozen pages, the reader feels the very real consequences of violence and aggression and the plot only gathers speed from there. It especially begins to escalate when the real threat against Olympus Prep arises and Zeus begins to show the true core of his character, to the delight of the reader. If anything negative can be said against the plot and world building of the book itself, I would say that Ledbetter’s technical skill could use a bit of Olympus grace. While reading, I found some of the sentences awkward, while others were quite unnecessary based on context. This forced me out of the story. Beyond that, I found the dialogue to be inconsistent along the lines of pushing melodrama or self-deprecating humor. This is not to disregard the appreciation I had for his presentation of different cultures that actually did have their own way of speaking. All of this taken into account, the reader of YA literature will not be disappointed. Following in the footsteps of Rick Riordan, yet also striking out on his own when his path diverges, is not a feat to be taken lightly. Ledbetter achieves this with brilliant originality and a story uniquely his own.